The deep red of this crimson garnet gemstone meets a warmly colored yellow gold in Apples of Gold Jewelry's plain garnet cross pendant in 14K yellow gold. The garnet stone is held in place by a prong setting, and adds extra flair to this polished yellow gold pendant for women. The genuine garnet stone measures 1.75mm in size, while the overall size of the pendant measures 1 inch tall and 1/2 inch wide. The AA rated garnet stone is sure to make this pendant a quick favorite! "In all thy ways acknowledge him, and he shall direct thy paths. "(Proverbs 3:6). 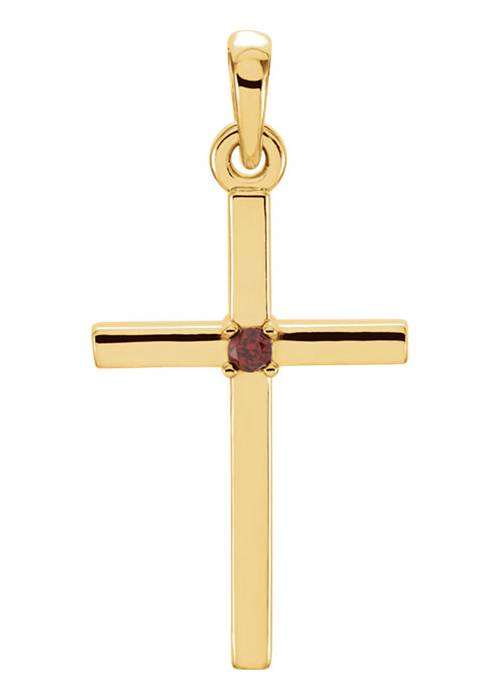 We guarantee our Plain Garnet Cross Pendant, 14K Gold to be high quality, authentic jewelry, as described above.